If you have a database of e-mail addresses, you can import it into edrone. How to prepare the database file? Upon saving, remember about proper encoding, i.e. UTF-8 (without BOM). Avoid characters such as ' or ". If the file has been prepared correctly, go to the SETTINGS section,select IMPORT, and then click on UPLOAD CSV. Select the CSV file from your hard drive. You will then be able to assign specific fields from the file to specific types of information. Select your preferred option for each type. Each selected column is mapped – select the information you need in the e-mail,e.g. name, language, e-mail, and optionally a tag (if it was previously added to the system). For each field, you can check the option “Overwrite existing”. This way the information from that column will be updated (use it when the previous import contained wrong data, which you want to correct, or no data, e.g. telephone number). On the left, select the status for the entire database (if it is homogenous). 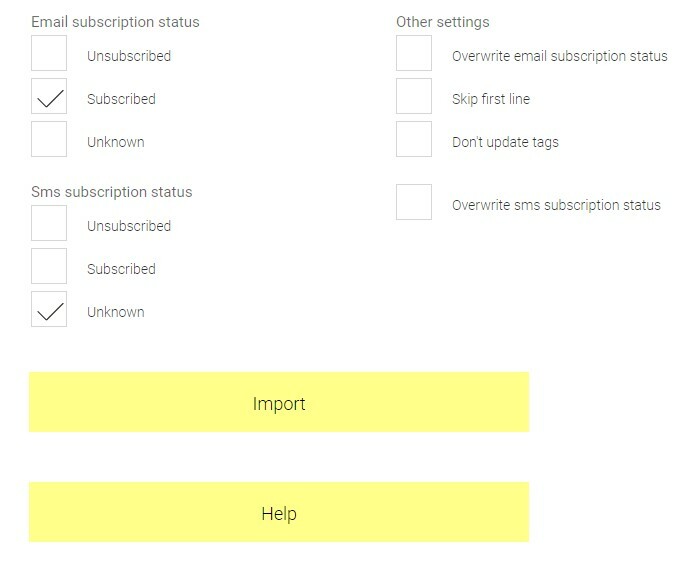 On the right, you can “Overwrite existing subscription status”(if existing customers in edrone have the “unknown” status, and they have already subscribed to the newsletter, or the other way round – they unsubscribed from it and should no longer receive any content). “Om it first line”– check if it includes column names and not customer information. Selecting the “Invert” option will automatically change the reading (0 –unsubscribed, 1 – subscribed). no value – means that the status is unknown and the entry will be imported with such status. These are the store customers who did not subscribe to the newsletter (they did not agree to receive marketing content). Pay attention to status labels and bear in mind that the store platform from which the database has been exported may label them differently. Note that during the import the system independently detects duplicate e-mail addresses and adds the first one. Therefore, there is no need to filter the database in this respect. The tags that you add to the entries should have been saved in the system earlier. (Customers -> Tagged -> Add). If a single customer has several tags, they should be displayed in a single relevant column (tags), after a comma. 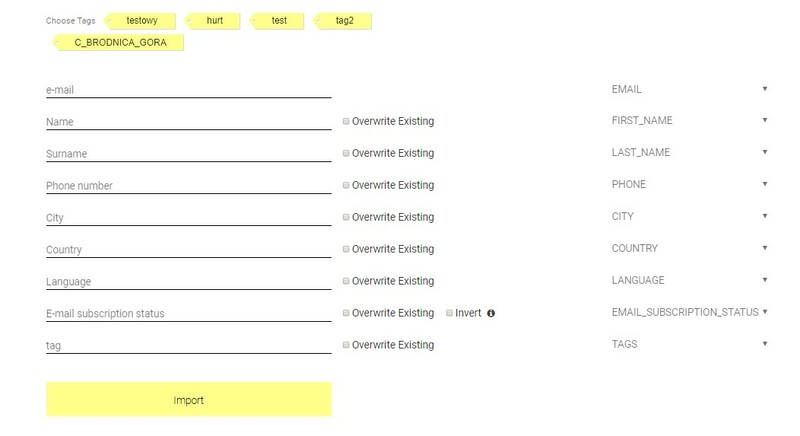 Note: If, next to the column with the tag, you select “Overwrite existing”, then the tag added to the user will be overwritten with the new one. In order not to delete tags, but add them only, you must upload the database with the option unchecked. You have an invalid separator in the CSV file - only the database separated by commas or semi-colons are accepted. In such case, you must export the database from the store platform and once again separate it with the valid character. If the store platform does not offer such option, open the file in Excel (or another editing software) and select CSV file in the export settings. The field includes an invalid value, e.g. in edrone the subscription status is marked with either "0" or "1", therefore any other value, e.g. "Subscriptions" will cause an error. In such case, change the statuses in accordance with edrone labels. The tag was not previously added to the system and you are mapping a column with tags. The size of the file is more than 20 MB (if so, divide the database into several files). The name of the file includes dots - in such case, the database will not be imported. The file has not been saved with UTF-8 encoding - convert it to this format (using, for example, free of charge software such as Open Office, Sublime, Notepad ++, which allows for changing the encoding) by selecting "Save as" and the right encoding (Unicode UTF-8). Simultaneously, the option of mapping the tag from the file is selected and the tag for the entire database is assigned. In such case, the system does not know which tag should be assigned to the user. Use one of these options only. Place the names and surnames in separate columns. Delete the columns which are no longer used - e.g. with an address. In this case, the issue is "INVALID EMAIL", i.e. invalid value in the “e-mail” column. The character " must not be used. UNHANDLED PARSE EXCEPTION– our error, which you must report to the Support. If, once you have solved the above issues, you are still unable to properly import the database, use the HELP button and report the fact to the Support (hello@edrone.me). The database will then be saved on the server and we will beable to help you.